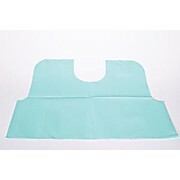 Breast pocket provides convenient, no-hands placement of telemetry unit. 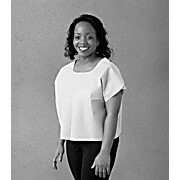 Three sturdy snaps provide modesty, privacy and a secure fit. Side vents provide convenient exit for stress cable. Generous cut offers ample room for procedures and exams. 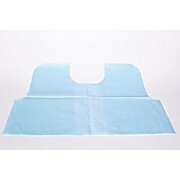 Blue, non-woven SMS material. Convenient front snaps and open sides for ample coverage and convenient access. Spunbond/meltblown/spunbond (SMS) nonwoven offers soft, cloth-like feel and exceptional strength and performance. Generously sized for modesty. 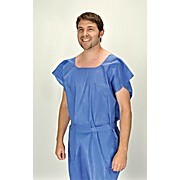 Ideal for a variety of women's health exams and multi-phase procedures. 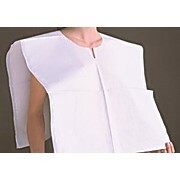 Waist length cape made of 3-ply tissue. 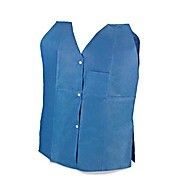 Overall embossed in an attractive pebble pattern. Front/back opening.